The End of Rolling. Sort of. My 2013 essay, “Beating, Rolling, and Pressing: The Compression of Book Signatures Before Sewing” in Suave Mechanicals, Vol. 1, ended with many questions concerning when bookbinders generally stopped using the rolling machine. Endings are much messier and imprecise than beginnings. 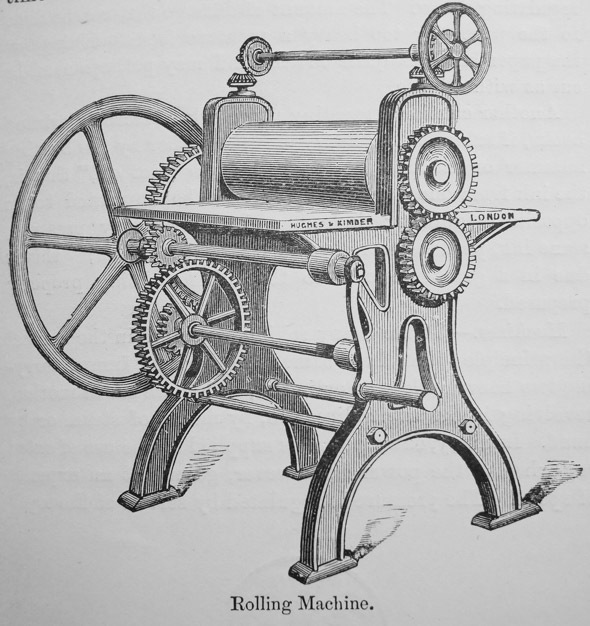 We know that the rolling machine was introduced to the trade in 1827. But when did binders stop using it? Many tools and machines in bookbinding are used for centuries. Rolling Machine from Joseph W. Zahnsdorf, The Art of Bookbinding, 6th ed., London: George Bell and Sons, 1903. (11) My Collection. Bonus question: what is missing in this illustration? We know that the use of the rolling machine gradually declined at some point during the nineteenth century. Yet It is still referenced in several 20th century bookbinding manuals, including Zaehnsdorf’s 1903 edition of Bookbinding. Zaehnsdorf had a deeply personal connection to the machine: his father’s right hand got trapped between the rollers, and even after many months in the hospital, he never regained complete use of it. It had an impact on him, so to speak. A couple of weeks ago, while looking through the Richard M. Hoe and Company records, 1824-1953 (MS#0599) at Columbia University’s Rare Book and Manuscript Library, I read a fascinating typescript, written by Steven D. Tucker, who began working for Hoe in 1834 as an apprentice mechanic. It is filled with recollections of mechanical details of machines, the evolution of the factory, and the types of machines they were making. In particular, he writes that in 1856, “There was also brought out (sic) a Book rolling or pressing machine, but few of these were ever built, bookbinders seeming to prefer the large embossing press for that purpose.” (43) To me at least, this seems a good indication of the transition time. Hoe thought the rolling press was still in demand, at least enough to warrant the development and manufacture of one, but he was slightly behind the curve, as many binders moved on to using an embossing press to compress signatures before sewing, ending the era of rolling and beginning the era of smashing. R.I.P. the Rolling Press, 1827-1856 ish. I believe the Tucker typescript was published some years ago, though I don’t have a citation to hand. Possibly it was included in a longer book. Don’t forget that Tucker was writing about the situation in America, whereas most of what we read about rolling machines comes from England. If I remember correctly, Americans were using large, high-pressure, powered stamping presses almost from the start, and were using them for “smashing” as well as blocking. I think there is some information pertaining to this in Rogers’ neglected essay on the development of edition binding in America, in Lehman-Haupt’s “Bookbinding in America: Three Essays.” My guess is that rolling simply never caught on in America. By the time of Pleger, smashing was done with dedicated smashers and “bundling presses,” but by direct pressure, not rolling. Another data point: the Harrild catalogue of 1892, as republished in 1988 in Sydney, includes six rolling machines, but with just one quarter-page illustration. Most of the arming presses in the catalogue are unpowered (two illustrations, with various sizes). They did offer a “new patent steam arming press,” but with details on application and no illustration. It would appear that, on pre-compressing, English and American practice parted ways fairly early. Initially, Americans used general-purpose powered stamping press/smashers for both blocking and compressing; later, smashers were direct-acting, not rollers. The English used separate arming presses and rolling machines, not necessarily powered. This situation apparently persisted until after the First World War. Jeff, I have just read your full article in Suave Mechanics, Vol. 1. This is a fantastic piece of work shining light onto an aspect of book production that is sadly overlooked. I found the notion that bindings in blue paper were often left un-beaten interesting – the soft un-beaten feel of these books is something I intuitively knew, but will now look out for more closely when trying to identify publishers’ bindings. I believe that the BL still has a beating iron. From memory I think that it is a square iron block mounted on a wooden post at about waist height. During my time there in 2008-9 some of the longer serving members of staff mentioned that it was used ceremonially – to celebrate the completion of an apprenticeship. The beating machine had two large metal platens between which the sections would be crushed. The top platen (powered with a small motor via a large leather, belt-driven, flywheel) would slowly move up and down continuously while the operator inserted the sections. We would adjust the machine to a set thickness (about 10cms) and then insert about a quarter to a third (of the surface area) of the sections at a time in to the ‘mouth’ of the machine – starting at the spine and working around in turn so each edge would get compressed in turn. The sections would be instantly reduced in thickness by about 20%. This particular machine was referred to at the time as ‘the nipper’ but I was wondering whether this is what you are referring to in your article as a ‘smasher’? I am no longer in contact with the company since its move, but fear that this rare example of a beating machine is probably no longer. Thanks for the kind words and info. Even with an unprinted textblock it can be instructive to experiment a bit with beat- it changes the feel entirely.